Achievement Objective: GM6-6: Use trigonometric ratios and Pythagoras' theorem in two and three dimensions. This unit explores the magnitudes of sides and angles of a triangle and leads to the discovery and proof of the Cosine Rule. This Rule is then used to solve triangles, some of which arise in practical situations. We note that the Cosine Rule is a generalisation of Pythagoras’ Theorem. Note that this unit may contain more material than you need for some classes. You may want to choose from parts of this unit if you have not allotted 5 sessions on the Cosine Rule to your class. This unit concentrates on the Cosine Rule and its application to solving triangles, that is, to finding the unknown sides and angles of triangles. We start out by leading the students to discover the Rule as a conjecture that is a variation of Pythagoras’ Theorem, then we prove the conjecture, and use it on a variety of triangles. There is then a practical exercise where the students are given the chance to measure something in the school grounds. Finally we consider the Cosine Rule as a generalisation of Pythagoras’ Theorem. It may be that there is too much material here for your Level 6 class. If your time is limited, you may want to choose from what is offered here. To help you decide which sessions you might want to do we list the content of the sessions and which sessions fit together. Sessions 1 to 4 can be restricted to included angles that are less than 180º. Sessions 1 and 2 involve the discovery and proof of the Cosine Rule. Session 5 spends a little time talking about generalisations. Note that we introduce the Sine Rule in the unit I'm So Sorry I Ate Chocolate. This unit has a session on a comparison of the use of the Cosine and Sine Rules. (This comparison is not considered here.) You will notice that we take almost the same approach to the Cosine Rule as we do to the Sine Rule. Here we recall Pythagoras’ Theorem, see that it doesn’t hold for non-right angled triangles, and try to find something that might hold for non-right angled triangles. As we have noted above, this may be more material than you will need for an average to good Level 6 class. However, this lesson, or part of it could well be given to Level 5 students to prepare them for the Cosine Rule later. We approach this session by posing a problem about solving triangles that the students should not yet know how to solve. In order to make progress with the problem (that we will not be able to solve until the next session) we need to recall Pythagoras’ Theorem and see that it is not enough by itself to enable us to find the sides of every triangle. In other words, that Pythagoras’ Theorem can only be applied to right angled triangles. Given that this is the case we need to find a more general formula that applies to triangles in which no angle is a right angle. In order to ‘discover’ the Cosine Rule, we work through several examples to see what kind of a correction factor we need to apply to the rule given by Pythagoras’ Theorem. We do this using a table to focus the students’ attention on the important parts of the process. You will find that it is easiest to see the correction factor if you start with triangles with suitably simple lengths. So we suggest that students first work on triangles with sides b = c = 1. They should all do these examples to make sure that they understand what they are doing. Then the class could be split into those working on the table for b = 1, c = 2; b = 2, c = 1; and b = c = 2. Note that we are approaching this problem systematically. This careful approach should be discussed as part of the introduction to the production of the data that will lead you to the Cosine Rule. Get the class to carefully construct the following diagrams using instruments. Then complete the tables using careful measurement of the triangles that they have drawn. a2 = b2 + c2 – 2bc cos A. This is the well known Cosine Rule. Pose the following problem: How can we find the length BC in the triangle ABC? Discuss with the class how they might solve this problem. Note (i) None of the angles in triangle ABC is a right angle so the straight use of sine or cosine is not possible. (ii) If students know how to use the Sine Rule, they will see that we don’t have one side and its opposite angle. So the Sine Rule cannot be used here. Suggest that this problem is too difficult for the group right now and that you will need to try to find a general rule that somehow extends Pythagoras’ Theorem. Then lead them into discovering the Cosine Rule using the approach suggested in the Teachers’ Notes. It may not be possible to get to the Conjecture by the end of this session. We continue this in Session 2. Here we complete the discovery of the Cosine Rule and justify that Rule. Once again you may not want to do all of this with all of your students. As always, it is up to you to decide what is most appropriate with the class that you have. Having obtained the Conjecture it is now time to find a proof. We give this proof below. a2 = (b sin A)2 + (c – b cos A)2.
a2 = b2 sin2 A + (c2 – 2bc cos A + b2 cos2 A). Now in the diagram the angle A is less than 90º. It is just possible that something may go wrong if this is not the case. So we will now check out that case. To do this we need the diagram below. In triangle CBE, the sides are a, b sin (180º – A), and c + b cos (180º – A). 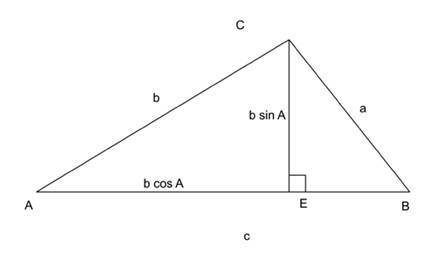 a2 = b2 sin2 (180º – A) + (c + b cos (180º – A))2.
a2 = b2 sin2 (180º – A) + c2 + 2bc cos (180º – A) + b2cos2 (180º – A). a2 = b2 + c2 + 2bc cos (180º – A). It looks as if we’re OK and that the one rule holds where the angle opposite the side a is both acute and obtuse. If necessary complete the tables from Session 1 and arrive at the Conjecture by discussing what general correction factor needs to be applied to work in all cases. Before attempting to prove the Conjecture go back to the problem posed at the start of Session 1 and show how the Conjecture might be applied to find the unknown side BC there. Really able students might be able to work out the proof of the Cosine Rule for themselves with a hint or two from you. It is likely though that, even for the good students, you will need to go through the steps in the Teachers’ Notes. At first only take them through the acute case. It is worth doing this so that they can at least see that a proof can be given that uses nothing more than things that they already know. Go through it carefully so that they can see that there is nothing mysterious about the proof. Let them write the proof in their books. At this point the Cosine Rule needs to be tested further. It should be noted that in every triangle that we have worked with so far, the included angle is acute. 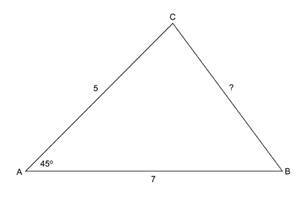 Does the Cosine Rule hold for triangles in which the angle A is obtuse? Repeat the drawing and measuring exercise of Session 1 using a triangle with A bigger than 90º. The Cosine Rule seems to hold in the case of A > 90º. Give the students a chance to attempt a proof of this and then take them through it carefully discussing every detail. The Cosine Rule is applied to find the sides and angles of triangles. This session provides a chance for students to practice the use of the Cosine Rule on triangles. A set of examples can be found in copymaster 1. 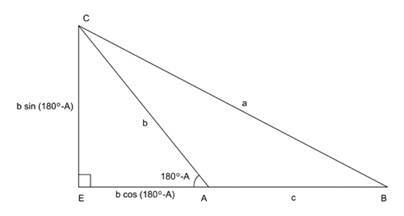 In going through the use of the Cosine Rule to find an unknown side opposite a known angle, students will need to know the formula and realise the significance of a, A, b, and c. Stress this when doing your example. To find the angle when all of the sides are know, they will have to be able to rearrange the formula. Here is a possible example for class discussion. 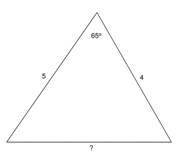 Find the unknown side and angles in the following triangle. a2 = 42 + 52 – 2 × 4 × 5 cos 65º = 16 + 25 – 40 × 0.423 = 24.1. 42 = 52 + 4.912 – 2 × 5 × 4.91 cos B.
cos B = 33.1/49.1 = 0.674. Use a class discussion to take students through applications of the Cosine Rule to solving non-right angled triangles. First check that they can see how you might find an unknown side given two sides and their included angle; then go through how to find the angles of a triangle given their three sides. One thing you might want to discuss here is the accuracy of answers. It is up to you how many decimal places to require. Give students the chance to work in pairs on copymaster. After they have been successful at a few of these you might want them to finish off the set on their own. Let the students report back their answers. Students should make appropriate notes and put them into their books for future use. In this session, the Cosine Rule is applied to find the sides and angles of acute angles triangles in practical situations. In the school grounds it may be that you have two trees on adjacent sides of one of your buildings as in the diagram below. Suppose that you need to find the distance between T1 and T2. (It may be that the roots of two trees of a certain type will intertwine if they are too close together.) How would you do it? One approach is to take an arbitrary point X which is in a direct straight line with T1 and T2 and such that it is easy to measure XT1, XT2, and the angle T1XT2. Then we can find T1T2 using the Cosine Rule. It would be better for this session if several such situations could be found so that not all of the class is working in the same space at the same time. If this is possible each group of students should be able to collect data from at least two of these locations. On the other hand, part of the congestion problem can be solved by encouraging students to choose different points X as the basis for their measurements. Choose a situation (or situations) at your school where an inaccessible distance needs to be measured. Discuss how they could use the Cosine Rule to help them find the distance. Consider what measurements need to be made to find the unknown distance. Discuss difficulties that may exist (such as how do you determine the points T1 and T2 with any accuracy). Also consider how errors might occur in the students’ measurements. Give the students time outside to do their measuring in groups of two or three. In the class, students should work out each of the distances T1T2 using three sets of data. Discuss the results. How accurate are they? What would you do differently next time? Give the students time to write up their results in their books. We apply the Cosine Rule to more triangles including triangles found in word problems, and discuss the relation between the Cosine Rule and Pythagoras’ Theorem. The first part of this session is a repeat of Session 3 using copymaster 2. In the end we ask if the Cosine Rule generalises Pythagoras’ Theorem. A generalisation has two properties. First it is something that takes one situation and applies it to other situations. Second, the original situation is a special case of the general situation. For example, the sum of the interior angles of an n-gon is (n – 2) × 180º. This generalises the fact that the sum of the internal angles of a triangle is 180º. Looking at the interior angles of an n-gon takes one thing (the sum of the interior angles of a triangle) and applies it to other situations (n-gons). So we cover the first property. But the original situation is a special case of the general one. This is because a triangle is an n-gon with n = 3. So if we put n = 3 in the formula for the sum of the interior angles of an n-gon we get (3 – 2) × 180º = 180º. a2 = b2 + c2 – 2bc cos 90º. a2 = b2 + c2 – 2bc cos 90º = b2 + c2 – 2bc × 0 = b2 + c2. And this gives us exactly what Pythagoras’ Theorem gives us because a is the side opposite the right angle – it is the hypotenuse of the triangle. So the Cosine Rule is a generalisation of Pythagoras’ Theorem. Quickly recall the Cosine Rule and how you have used it in class and in your practical work. Give students the chance to work in pairs on copymaster 2. After they have been successful at a few of these you might want them to finish off the set individually. Lead a class discussion on the concept of generalisations. What generalisations have you met before? What does the Cosine Rule generalise?